Other than damaging their pride, Paris Saint-Germain?s improbable exit from the Champions League earlier this week at the hands of Manchester United is also likely to cause them a few financial issues. 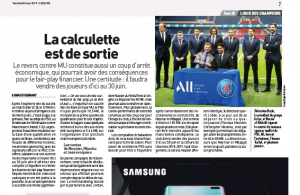 Banking on the money they would be getting from going into the next round (around ?15m), the Ligue 1 champions could now end up having to sell a couple of players before June 30th this year due to FFP regulations, such as Christopher Nkunku, according to L?Equipe. The midfielder, who was heavily linked with Arsenal during the January transfer window, has found some more first-team joy in recent weeks, starting the last three games on the wing against Montpellier, Nimes and Caen, scoring two goals in three games. For Arsenal and Unai Emery, this would represent a second chance to get their man, as the Spaniard appeared keen to bolster his team with his former pupil, having managed the 21-year-old during his time at the Parc des Princes. How much he is expected to go for isn?t stated, but there?s belief Paris Saint-Germain could get ?60-80m for the three to four players. By our advanced calculations, that puts them at around ?20m each, or ?10m for Jesé and the other two/three making up the rest.